Xeeber allows you to stalk users on the Yahoo Messenger network. Visit Xeeber.net, type in a username and their status will be revealed. 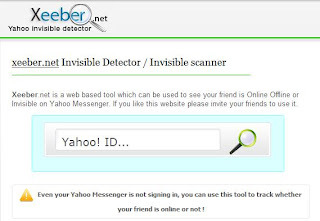 Even your Yahoo Messenger is not signing in, you can use this tool to track whether your friend is online or not. By entering your Yahoo! login info you can also import your Yahoo Messenger list to Xeeber.net.